Inspiring a happy sailor in everyone! School's out, time to play! We're calling all parents who want to gift your children with a meaningful experience this June holidays. 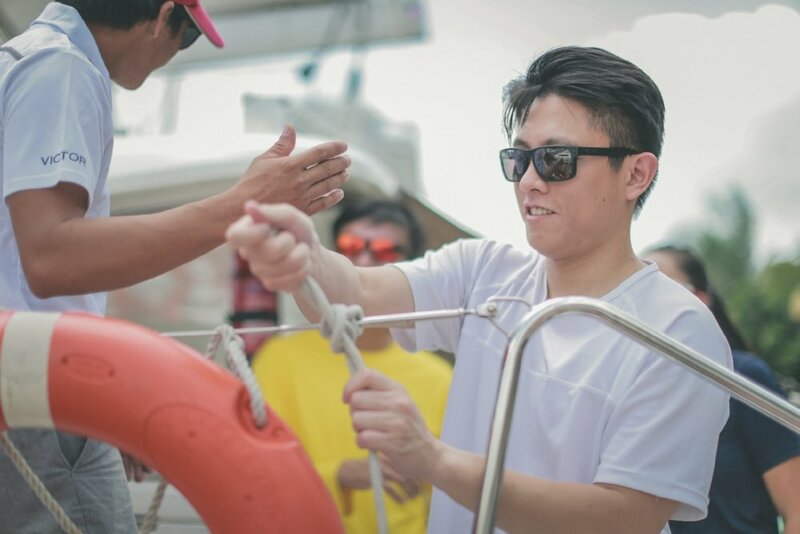 Spend some quality bonding time by taking your family out for a yacht stayover hosted by TV celebrity, Darren Lim, and his family. This event includes an introduction to sailing, a night hike with some stargazing at St. John's / Lazarus Island, and supper and overnight stay on board Gracefully - guaranteed to stay in your children's memories for a lifetime. Thank you for your interest in Ximula Sail! Please allow us to get back to you within 1-3 business days. After a long day at work, all you deserve is a refreshing break to recharge for the week ahead. Join us on our open sunset cruise, and let's relax and chill out together. Away from the hustling in the office, being out at sea with only the sound of the waves, a mesmerizing view of the sunset and the breeze in your hair, instantly refreshes you and lifts your spirits. 230 nautical miles far east from Singapore, the archipelago of Badas Islands is so remote that it is still uncharted on our navigation system and inaccessible to most tourists. As a result, the Badas Islands boast of abundant marine life and untouched, colourful corals, which literally feels like you're diving in a massive aquarium with 20 metres visibility. Don’t miss out on this epic itinerary which we’ve decided on as our annual pilgrimage. Discover the beauty of Singapore's archipelago of tranquil islands, perfect for a getaway from the hustle and bustle of the city's concrete jungle. Whether it's to Singapore's best kept secret (not so anymore) - Lazarus Island, or an island that played a critical role in Singapore's history - St. John's Island, our clients rent our yachts to celebrate all sorts of occasions, from birthday parties, to engagement proposals, to team bonding retreats, to client appreciation nights, or even just a simple get-together with loved ones. Charter our yachts for the most memorable yacht experience for all your guests. The best way to build more effective communication and stronger trust within a team is to put everyone in the same boat. With no other distractions and nowhere to run to, team players have to learn to understand one another and work together in order to sail the yacht to the destination of their choice through our experiential sailing programs. We believe that everyone is a leader on board a sailboat, whether he/she's the helmsman, the navigator, the wincher, or the lookout. Through hands-on experience of learning how to steer, navigate and sail a yacht through changing conditions, teams will emerge stronger and closer. Charter our yachts for unique outdoor events/programs out at sea, guaranteed to leave a wow impression on your staff, colleagues, clients or business associates. Treat you and your loved ones by chartering our yacht for a sailing holiday of a lifetime - immerse in the wonders of the great outdoors on board our elegant sailing catamarans and enjoy the thrill of exploration in harmony with the serenity of the open sea. Arrive at off-the-beaten-path destinations where stretches of sandy beaches and crystal clear waters rich with colourful corals and marine life await you. Set sail on your next adventure with us! In the meantime, follow us our Ximula Sail Facebook Page & Instagram @ximulasail for the latest updates!